« Enter These Fabulous Contests for Prizes. It’s So Easy. Women during the Regency period wore headdresses outdoors as a matter of course. When a woman married, or if she was a spinster in her late twenties, she would also take to wearing a cap indoors. This image from Wikipedia shows Mme. Seriziat wearing a bergere, or shepherdess-style straw bonnet over a cap, as was the custom back then. When her child was a baby, he might have worn a simple bonnet, as infants still do today. Aside from sheltering delicate skin from the sun or hair from the elements, or protecting one’s head in drafty rooms, headdresses took on many other functions. They denoted class and economic status, as well as fashion sense and one’s marital state. Hats were also worn as a sign of respect, inside a church, for instance, and this custom remained widely popular until well into the 20th-century. Lace caps, mob caps, or draped caps, were made of lace, white linen or delicate muslin, and trimmed with ribbon. They could be ruffled, embroidered, or plain, depending on who wore them and their status. A housekeeper, for example, would wear a more elaborate cap than a scullery maid, whose mob cap was simple by comparison. 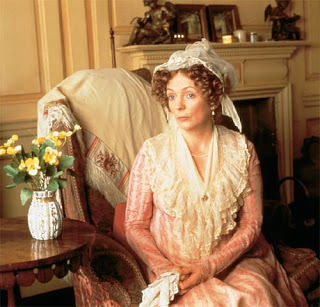 In Pride and Prejudice 1995, Mrs. Bennet wore such frilly caps with so many ruffles and trimmings that they complimented her image as a silly woman. One can imagine how much fancier her caps were than her maid’s! Flowers are very much worn, & Fruit is still more the thing – Eliz: has a bunch of Strawberries, & I have seen Grapes, Cherries, Plumbs & Apricots – There are likewise Almonds& raisins, french plums & Tamarinds at the Grocers, but I have never seen any of them in hats. In addition to professional milliners and modistes, there was quite a large cottage industry for making caps, hats, and turbans from home, which provided a meager salary for women who needed the income. The materials used in making headdresses were as varied as their styles: straw (chip or strip), beaver, velvet, silk, crape, satin, muslin or cloth (Byrde, p 6). Trims included ribbons, the above mentioned artificial fruits and flowers, veils, net, lace, or feathers, and even beads, pins, and brooches. For a more detailed explanation of the headdresses worn during this era and to view additional illustrations, please click on the following links. Ladies Regency Caps, Jane Austen Centre, provides a detailed description of caps. Jessamyn’s fashion page discusses caps, hats, bonnets, and turbans. Regency Women’s headresses: Find a fabulous selection of illustrations of the various styles at this site. Milliners, Modistes, and Hatmakers: Read a short but interesting description of how hats were made. Hats and Bonnets, Victoriana: Scroll to the bottom of this page to see illustrations from 1811 and 1812. Corsets and Crinolines: Find an image of an original Regency Era bonnet here. Fileblogs, Regency Caps, Linore Rose Burkhart: Linore describes the various hat styles in this link, along with materials and trims. Louise MacDonald Millinery (link suggested by Laurel Ann, see above image). Louise created the caps for Pride & Prejudice 1995, and describes making them for the movie. Byrde, Penelope, A Frivolous Distinction: Fashion and Needlework in the works of Jane Austen, Bath City Council, 1979. Four Hundred Years of Fashion, Victoria and Albert Museum, edited by Natalie Rothstein, V&A Publications, 1984. We have been to the cheap Shop, & very cheap we found it, but there are only flowers made there, no fruit–& as I could get 4 or 5 very pretty sprigs of the former for the same money which would procure only one Orleans plumb, in short could get more for three or four Shillings than I could have means of bringing home, I cannot decide on the fruit till I hear from you again.–Besides, I cannot help thinking that it is more natural to have flowers grow out of the head than fruit.–What do you think on that subject? Jane is so droll, like a favorite girlfriend you can’t wait to meet for lunch because of her witty observations and take on life. Thank you so much for sharing! I’m wondering where I can get a straw hat similar to the one Kate Winslet is wearing when Alan Rickman is reading to her towards the end. I love it and know it would fit my personality! Anyone know? Jane Austen Festival Australia have just released a regency bonnet e-pattern at http://janeaustenfestival.blogspot.com/2012/01/lynne-cooks-regency-bonnet-pattern.html and are teaching bonnet making workshops at Jane Austen Festival Australia http://www.janeaustenfestival.com.au in April each year.